PTA students, left side, and Graphic Design students are teaming up on a mapping project to help visitors with mobility issues better navigate the West Windsor Campus. 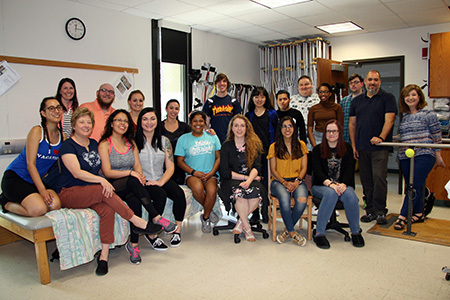 Pictured second row, far left, is PTA Club advisor Holly Kaiser; Graphic Design club co-advisors Maura Zamora and Tina LaPlaca are pictured at far right. Graduating Graphic Design student Patrtick O'Callaghan used Google maps to create an overview of the campus that the club is using to designate key areas. He is pictured with faculty members Tina LaPlaca and Mauro Zamora. West Windsor, N.J. – In a collaborative project between Physical Therapists Assistant (PTA) students recognizing a pressing need and Graphic Design students with the skills to create visuals, a new map of Mercer County Community College’s (MCCC’s) West Windsor Campus (WWC) will soon be added to the MCCC website. The map will provide disabled students and visitors with a handicapped-accessible location guide for parking lots, elevators, doors, bathrooms, and more. According to Professor Holly Kaiser, people who are in wheelchairs typically need to arrive at new places 30 to 45 minutes early to ensure that they can park, get into a building, find a convenient bathroom, and locate an elevator. The project began this spring, when the PTA Club spent several days canvasing the West Windsor Campus. They documented all of the accessibility points, including handicapped parking spots, accessible doors, bathrooms and elevators. Now it’s the Graphic Design Club’s turn. According to Professor Tina LaPlaca, who co-advises the club with faculty member Mauro Zamora, students are using this data to create a WWC map that the college will post to its website. “This will enable anyone who uses the college and has accessibility needs to have a thorough understanding of the campus layout and its buildings. Information Technology staff and administrators have added enthusiastic support to the project,” she said. Graphic Design students are currently creating basic drawings and have already established a key. “We plan to have the map completed by the fall semester,” LaPlaca said, adding that the map will be helpful in ensuring the college’s ADA compliance. 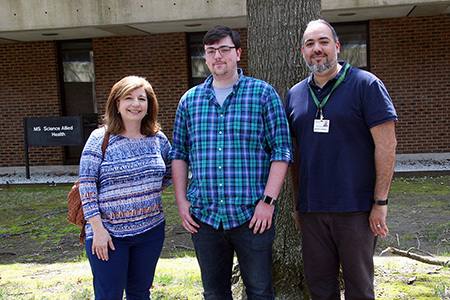 Graphic Design student Patrick O’Callaghan will graduate in May, but has done his part before he transfers to The College of New Jersey in the fall to study Interactive Multimedia. “I did a Google map search of the campus and took screen shots of each building from the top down,” he said. “This will give students the model they need to designate appropriate areas." O’Callaghan said he got involved in the club last fall and is glad that he has been able to contribute in such a meaningful way before he graduates.